I am working my way through the Operation Write Home Design Boot camp (Boot camp page). The first lesson is 'The ABCs of Color (Basic Color Theory). I approached this lesson and chose to try out a card with the Monochromatic theme. The pattern paper is from Colorbok, a Wal-Mart brand, and the solid paper is something I had in my scrap basket. I can't remember where the brads are from they were in my stash. 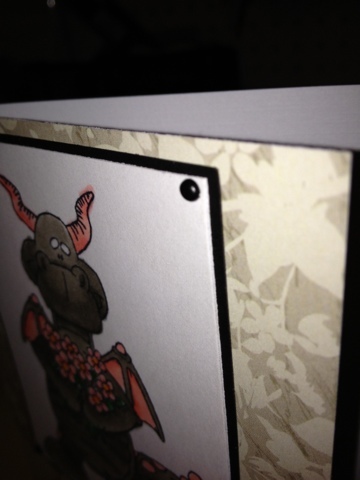 Finished card size is A2. Go take a look at the design boot camp lessons, there is something for everyone. I stopped at my Local Craft store, Scraps of Love to do some retail therapy and found the cutest stamp that I just had to play with. 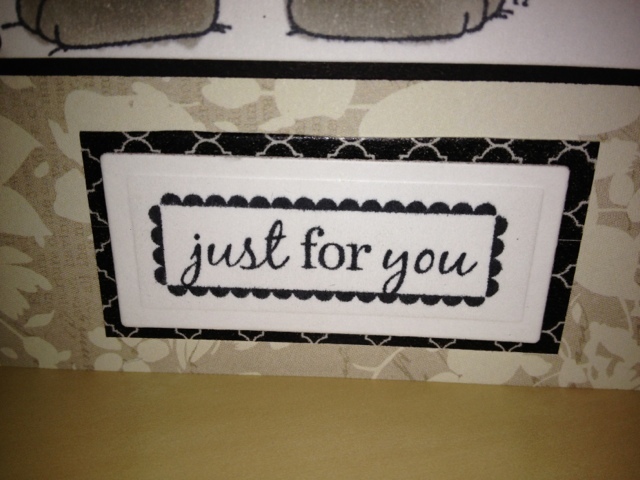 The finished card size is 5 1/2 x 4 1/4. Background paper is Now & Then by Teresa Collins. Sentiment stamp is by Fiskars 'All Year Cheer' and the background for the sentiment is from a decorative tape set by My Mind's Eye. 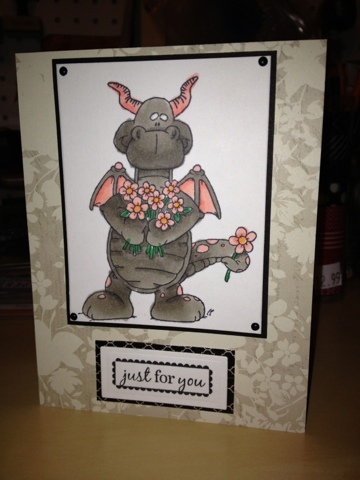 The dragon is Daisy Dragon by Talkabout Impressions and colored with copics. Colors used were W6, W5,W4, R22, R21, R20, G19, and YR04. My blog ran into some scheduling hiccups in 2011 and I haven't been able to get them resolved, until now. My New Years resolution is to post a project once a week starting in January. My hopeful goal is that by getting in a routine and posting once a week, I can be ready for some design team calls that will happen towards the end of 2013. I look forward to reading your comments and having some crafting time for my soul.